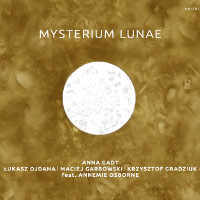 This is the fifth album by Polish vocalist/composer Anna Gadt and her second cooperation with the fabulous Polish piano trio RGG, which comprises of pianist Lukasz Ojdana, bassist Maciej Garbowski and drummer Krzysztof Gradziuk. Cellist Annemie Osborne from Luxembourg is the guest artist. The album presents seventeen pieces some of which incorporate four poems written by the Polish/Jewish poet Bolesław Leśmian, but most feature only wordless vocalese. Nine of the pieces were composed by Gadt, one each by Ojdana and Garbowski and the remaining six are improvisations. The album was recorded at the excellent Studio Tokarnia and engineered by Jan Smoczyński, with the usual superb sound quality. From the very onset of the album it is obvious that this is her most ambitious effort so far, mostly improvised and full of complex melodic themes, which last sometimes only for a brief moment before being transformed into another improvised passage. With wordless vocalese dominating the proceedings, this is perhaps the boldest step in Polish vocal Jazz since decades, bridging the void stretching over forty years into the past, when Urszula Dudziak created her revolutionary vocal experiments in the early 1970s. Gadt is exceedingly fortunate to develop the collaboration with RGG, who are one of the most open minded and technically proficient Polish ensembles able to match her vision, which as a result goes way beyond accompaniment and becomes a fully integrated musical creation. The piano trio also moves consistently over time towards more open formats and Improvised Music, and proves to be a most amicable companion to Gadt, which is fully demonstrated herein. It is also very satisfying to see Gadt embarking upon the ambitious and highly aesthetic Jazz & Poetry idiom, especially in view of the fact that a century old poems are able to become a part of today's avant garde, alive and kicking, timeless and penetrating. Words and sounds combined are able to build highly complex and intricate intellectual structures, which can be, when properly executed like in this case, more potent than simply the sum of their ingredients. Overall this is a brilliant piece of contemporary music, fascinating, exciting and challenging, which is a sublime proof of the fact that music knows no limits and there is always a way to step beyond the horizon. My sincere thanks to the musicians involved, not only for the intellectual pleasure their music bestows upon the listener, but primarily for keeping the ray of hope alight in a word full of mediocre darkness. Hats off Milady and Gents!